Anti poaching drones are making a big impact in the saving of Rhinos, Elephants, Tigers, Gorillas and many other critically endangered species. Drones with anti poaching technology are assisting Park Rangers across the globe and especially in Africa and Asia. Drones are relatively cheap, can cover hundreds and even thousands of acres in a short space of time and can beam back live video transmission. Using Infrared and thermal imaging, drones can also be used under the cover of darkness which is the favorite time of criminal poachers. In this post with videos, we look at the best anti poaching drones along with wildlife protection projects such as saving elephants, rhinos, tigers and many other endangered species. The illegal wildlife trade is the 4th largest illegal trade behind drugs, people smuggling and counterfeiting. It is worth an estimated $4.5 billion annually. It has heavily depleted some populations and has brought others to the verge of extinction. While the threats to flagship animals like elephants, tigers and rhinos are well known, other species don’t receive the same attention. Yet illegal trafficking in both live and dead specimens – whether for pets, medicines, trophies, food or a host of other purposes – threatens a huge range of wildlife. Controlling it is a global priority. Together with poaching, the deforestation and the destruction of rainforest and grasslands also cause species to become endangered. Fixed wind drones cover large land mass and are playing a big part in the reduction of illegal destruction of habits in nature reserves and parks. Drones with surveillance anti poaching technology work with local rangers and communities to collect and analyse data to determine threat areas and to organize drone flight plans. Rangers are pre-positioned where they can be deployed quickly within the threatened areas. Mobile command and control units are moved close to the threat areas and where drones can be flown from. Pilots fly the anti poaching drones along pre-planned routes from analysed data. They can also easily change direction through analyzing the live data if wildlife or potential poachers show different movements . Most poaching happens at night under a full moon. Drones with infrared cameras and thermal vision cameras are essential and can detect movement at night. When poachers are spotted the drone operators in the mobile command center radio the location of the poachers to ground troops which are close by. The rangers can then swoop in and catch the criminals. All data is stored and analysed to assist with future missions and to understand patterns used by poachers. Fixed wing anti poaching drones carrying a variety of sensors and technology are used. Many anti poaching projects now use a combination of fixed wing and quadcopters. The long range drones can be used for quick scans and a large overview. Smaller drones can be used when threat areas are detected, mobile units and ground Rangers are close by. Anti poaching drones uses many powerful control systems and sensors which give them extraordinary capabilities which are ideal for the anti-poaching mission. Every drone will have a solid-state inertial system (IMU) that maintains its flying attitude, regardless of winds, etc. The drone will also have an internal GPS receiver which tells the aircraft where it is (and where the cameras are looking) at all times. Some anti poaching drones will have at least two zooming camera systems which are carried on gyro-stabilized gimbals. These keep the cameras pointing at the same location, regardless of bumpy air or heading changes. One camera is designed for visible light and is operated during the daytime; the other is an infrared sensing device that provides thermal imaging (heat signatures) during hours of darkness. In the future, we may also see ToF sensors been used as Time-of-Flight cameras on drones have the ability to “see” into obscurants such as fog, smoke, mist, haze and rain. On-board datalink communications keep the aircraft in touch with the Ground Control System, sending navigation, piloting and camera operation instructions to the aircraft and downlinking positional and live video streams from the camera systems. The communications links are encrypted for security. Turning raw data into real information is vital. Predictive analysis integrates several factors including: the poachers’ known past behaviors, terrain information (elevation data, trafficability data), and the movement patterns of wildlife. The platform develops a coordinated theory which has been successful in all tests and live applications. Here is a quick overview of how drones are making a big difference in stopping poaching. For anyone looking to start a anti poaching project, there are many considerations and questions you need to ask and answer. Here is an excellent article with the questions you need to ask regarding the use of conservation drones. Here is 8 drones which are being used around the globe in various anti poaching missions and conservation projects. Over the past six years, more than 80,000 Tanzanian elephants have been slaughtered for their ivory. These are scary numbers. 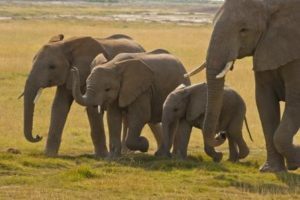 Now poachers in Tanzania’s Tarangire National Park face a new foe after the African nation’s park service announced a new drone patrol in June 2016. Park law enforcement will patrol the region using Super Bat DA 50 drones by Martin UAV. The fixed-wing aircraft has a 15,000 flight ceiling and can cover a 6 to 10 mile radius with a fuel range of 450 miles. Bathawk Recon, a Tanzanian UAV startup, operate the fleet. The Super Bat Da-50 conservation drone has a 2 stroke gasoline engine and can fly 8 to 10 hours depending on the mission and payload. It also uses battery power while on the ground. 45 to 80 miles per hour. Fully autonomous flight capability including launch and landing. Here is a look at the anti poaching project in Tanzania where Bathawk Recon are playing a major role. Air Shepherd is a program of the Charles and Anne Morrow Lindbergh Foundation. They are dedicated to the elimination of illegal poaching of elephants and rhinos in southern Africa using cutting edge software based predictive analysis and drones to stop poachers before they are able to reach the target animals. Air Shepherd provide the full anti poaching solution. This comprises of the drone, mobile command center, predictive software along with data storage. They have a number of anti poaching drones with the ZT-TIC and ZT-TBV fixed wing drones being the most popular. In many missions they will also use traditional quadcopters such as DJI Inspire or Phantom 4 drones. Air Shepherd drone teams patrol in Hwange National Park, Zimbabwe and fly both during the day and night to look for poachers who are poisoning watering holes with cyanide. Expansion of operations to Malawi, where they are flying in Liwonde National Park and Nkhotakota Wildlife Reserve. 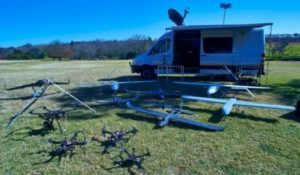 In 2012, with the onset of the rapid increase in wildlife crime and specifically rhino poaching, Ezemvelo KZN Wildlife entered into an agreement with a service provider to undertake a pilot rhino security aerial surveillance and monitoring project using UAVs. The main objective was to reduce rhino poaching attempts and provide effective protection of the Hluhluwe, iMfolozi Park (HiP) rhino population. This project continued for a period of two years, and the mortality statistics from start to termination of the project clearly showed a significant decrease in poaching mortalities: a 65% reduction in rhino poaching compared to the previous year. Since that time UAV tactics have been upgraded resulting in no poaching deaths in any area where drones were flying in the last six months. The decrease in poaching is greatly attributed to the presence of drones in the park, combined with other strategic law enforcement and monitoring projects and operations. Here is a terrific video which talks about the problem of poaching and the Air Shepherd initiative. The Silent Falcon is a versatile system capable of performing a wide variety of missions requiring long endurance, long range and undetectable flight. It is a small Unmanned Aircraft System (sUAS) designed for numerous commercial, public safety, military and security applications. It is also ideal for protecting wildlife from poachers. The Silent Falcon’s solar electric propulsion systems allows it to stay airborne up to 5 hours of practical mission planning depending on flying conditions. When the conditions are ideal you can expect up to 7 hours. The solar electric propulsion system is what gives the Silent Falcon its ability to be virtually silent. Once the Silent Falcon reaches 100 meters, it’s effectively undetectable. 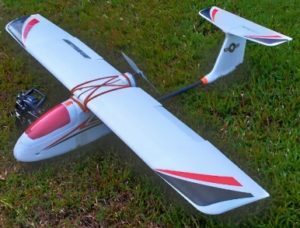 The composite structure of the Silent Falcon provides exceptional durability while flying in all types of conditions, as well as for launch and recovery. It’s also very lightweight for ease of transport and in air maneuverability. Using a highly sophisticated mesh network, wave relay communication system, the airborne network nodes provide seamless dissemination of voice, video, and data. With an Internet connection on the ground, you can provide secure and encrypted voice, video and data to anyone, anywhere in the world on your private Silent Falcon™ communication network. The large, open payload bay of the Silent Falcon has been designed with an open interface and open architecture to accommodate a wide range of sensors, cameras, and payloads. This allows the Silent Falcon™ to perform a large variety of extended range and endurance missions. With Silent Falcon’s solar electric propulsion system, rugged composite structure, and sophisticated mesh network wave relay communication system, and open interface/open architecture payload bay, it is the first sUAS capable of meeting long range, long endurance mission profiles for the widest possible range of applications. The Falcon UAV used in Namibia with the WWF Wildlife Crime Technology Project and Namibian Ministry of Environment & Tourism. Its rugged design includes a parachute landing for landscapes dominated by thorny acacia and mopane woodland. Open interface/open architecture payload bay accommodates off-the-shelf sensors and payload as well as tailor- made payload solutions. Numerous COTS sensors are readily available to be integrated as Silent Falcon™ payloads. If a there is a sensor that meets your needs and fits the integration parameters, we will work with you to design and integrate a payload with that sensor to meet your mission requirements. All Silent Falcon™ sensors are designed for simple installation into the Silent Falcon™ sUAS platform and include proprietary communication system interfaces for either on-board or ground-station data and imagery storage. Can easily integrate Lidar, Wide Area Motion Imaging (WAMI), and thermal cameras. GCS: SF Flight Planning and Control Unified Ground Control Station on Rugged Laptop Computer; payload control on second laptop; large monitor and all communication and power cabling on standalone GCS integrated into a single Pelican case. The FX-61 is a compact mid range UAV. The wing span is 1500 mm and can dismantle into three smaller parts ( two wings and one body ) which fit into a custom carry case. It can be configured to fit a range of cameras and sensors depending on the mission. The FX-61 can fly up to 60 minutes with a total distance of about 28 km (17 mile). 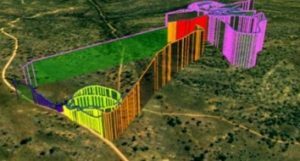 Flying at 1000 feet above ground level, it can easily cover 300 hectares of land and produce geo-reference maps at 10 cm per pixel resolution. The take off weight is only 1.5 kg, combine with a powerful motor make hand launch easy. The excellent design and low wing loading make this plane very easy to land in stabilized mode. Suriname in the north east of South America recently organized a drone training for nine rangers working for Suriname’s Nature Conservation Division. The goal of the training was to educate the rangers on how to use drones to monitor the vast tracts of forest they are charged with protecting. Conservation drones capture detailed high resolution images of objects on the ground. This may include human activities that threaten nature, like illegal logging, mining or poaching. With the help of drones, the rangers should be able to map areas of interest and detect threats more easily than before, when rangers’ routes were limited by roads, cost and time. The rangers were trained in the use of a FX-61 fixed-wing drone. They learned how to set up the drone, prepare it for use and plan its missions on a computer that communicates with the drone. Read further on the terrific Suriname rainforest conservation project. If you are looking to know further about the FX-61, you can use a company such as Hornbill to put together a package to suit your requirements. Flight Duration – Up to 60 minutes, depending on payload and weather conditions; up to 35 km total flying distance; up to 300 ha mapping area per mission. Keeyen Pang from the ConservationDrones Asia team developed a system which can fly for 100 kilometers (62 miles). It can be used as a mapping or video system and is based on a Skywalker air frame. The innovative feature of this system is the new power system. This enables the system to fly for approximately 3 hours and a 100 km with a payload of 200 grams which means it can carry a point and shoot camera such as Canon S 100 GPS on board. The total mass at take off is 2.9 kg. With 100km range, the new long range conservation drone opens up the possibility to map or video areas which were previously unreachable by drones. This Skywalker 100 km drone will also be very suitable to monitor rivers, roads, forest boundaries or any other mission which requires long-duration flight. Flying at 300 meters, this drone can map 1500 hectare at about 10 cm pixel resolution, which makes large area mapping possible with a single flight. Below is the specification and parts components for the 100 km Skywalker conservation drone. The Sumatran Orangutan Conservation Program is endeavoring to conserve viable wild populations of the critically endangered Sumatran orangutan. The SOCP team focus on habitat protection, rehabilitation and reintroduction of ex-captive orangutans to the wild, education, survey work and scientific research. Since 2012 the SOCP has been working closely with Dr Lian Pin Koh and Dr Serge Wich and colleagues at conservationdrones.org to develop innovative remote control aerial surveillance drones. They are using standard remote controlled UAVs, adapted to carry either video or still photographic equipment along with an autopilot system. The autopilot can be pre-programmed to fly at any height and follow a particular route, such as following the forest edge, or to cover a given area with a specifically designed transect system. The on board still camera can also be programmed to ensure photos overlap, so that they can then be stitched together to produce a mosaic, and even tied to a less detailed satellite image, giving a much more detailed view of a selected area of the image. In this way, they are able to survey areas which would be very difficult to reach otherwise, up to as far as 15 mile or more from a launch site. Potential uses for this new technology seem limitless. Not only do they include habitat monitoring and research, they can use drones to photograph orangutans in trees and their nests. In the future they will be able to detect radio transmitter chips implanted into reintroduced orangutans. This would be of an enormous help in monitoring the progress of orangutans newly reintroduced to the wild, something which is not easy to do from the ground. 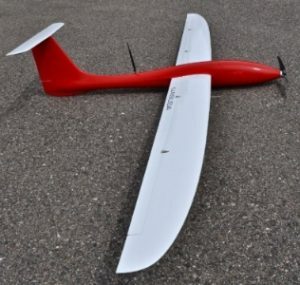 Currently, the SOCP team primarily flies with the Skywalker fixed wing airframe. In general fixed wing UAVs are necessary to cover large areas. However most fixed wing don’t have the ability to hover in place to grab accurate stills or film which may be necessary to prosecute illegal poaching and logging. One of the best quadcopters to accompany fixed wing conservation drones is the DJI Inspire 1. What really makes the Inspire 1 excellent for professional aerial filming, surveying and conservation is it’s super flight stability and it’s terrific range of camera options. It has many gimbal cameras options including the Zenmuse XT thermal imaging and Zenmuse Z3 zoom camera. The thermal imaging sensor is from FLIR which are world leaders in thermal imaging systems, visible-light imaging systems, locator systems, measurement and diagnostic systems, and advanced threat detection systems. The Zenmuse XT thermal camera provides image and video details which the naked eye could never spot by making subtle differences in temperature visible. Thermal images cameras are essential for night time viewing where almost 100% of criminal poaching activities take place. The DJI Zenmuse Z3 is an integrated aerial zoom camera based on DJI’s class leading Zenmuse X3 and optimized for still photography. A 7x zoom made up of 3.5x optical and 2x digital lossless zoom creates a 22 mm to 77 mm equivalent focal length range, making it ideal for many applications. You can read more about the very adaptable DJI Inspire 1 here. The UASUSA Tempest was designed and engineered specifically for the University of Colorado. The plane fit the University’s requirements for the National Science Foundation Tornado research project, Vortex2. However, the Tempest surpassed all of CU’s design specifications, and was 200% better than requested. The Tempest emerged from the latest trends in state-of-the-art sailplane flight profile, resulting in a sleek and streamline design. The Tempest possesses dynamic performance, something critical in the emerging civil drone market. Efficient – The Tempest is one of the most efficient designs in its class. With the supplied battery it achieves an hour and a half flight time traveling at 42-50 mph with a max of 110 mph. At a slower speed, the flight time increases. Additional batteries can be added for increased flight times. The Tempest offers quick and easy deployment. Distance – The Tempest can cover 3.6 square miles (2,300 acres) in one flight flying at 400 feet. Stability – The Tempest was designed to be an extremely stable platform. This provides a great platform for cameras, and sensitive payloads. Extreme Weather – Because of its stability and efficiency, the Tempest can operate in high, turbulent winds up to 60 mph. Composite Construction And Design – Its lightweight composite construction allows a more efficient, accurate design and additional payload capacity. Customizable – The Tempest is fully customizable to fit any payload or mission requirement. Their drones are large enough to accommodate multiple sensors and currently have a combination of platforms fitted for Visible plus Multispectral and Visible plus Thermal IR. This sensor options make them ideal for conservation and anti poaching missions. When Duke University researchers wanted to try counting seals with a drone, they headed to Canada with SenseFly eBees drones and several cameras, including a thermal sensor. The project’s results confirmed how UAVs can help save time and money, and highlighted the promise of thermal imaging. The eBee Classic can map more square kilometres per flight, than any drone in its weight class, giving greater efficiency to plan large conservation projects with confidence. The SenseFly eBee drones in a uniquely flexible tool. It is available with multiple camera payloads, so you need only invest in the configuration that suits your conservation requirements. Like the camera in your smartphone or SLR, RGB sensors acquire data in the visible spectrum (specifically Red, Green & Blue bands). The images they produce can be transformed into 2D orthomosaics (A.K.A. orthophotos) and 3D digital surface models. Such sensors have been used, for example to create terrain models of glacial features, monitor coastal erosion, perform volume measurements etc. The technology in 3D maps, also known as photogrammetry maps is the science of making measurements from photographs. By flying a mapped route and taking photos at regular intervals of say every 1 second, these images are then stitched together to create 3D photogrammetry images. To create 3D maps or models, all you need is a top drone with camera and GPS. The drone should be programmed using waypoints to capture images at say 0.5 or 1 second intervals. Then, to create the 3D maps a top photogrammetry software application will be used to stitch the photos. These cameras acquire data across bands in the visible and non-visible spectrums. This type of data enables users to compute vegetation indices in order to create reflectance maps for assessing plant health, estimating biomass and more. Temperature measuring thermal cameras, assign a temperature value to each pixel. The have already proved highly useful in conservation projects to count treetop Orangutan nests in Indonesia and assess the fight against Rhino Poaching in Namibia.